All Star Bowling and Entertainment has been in Draper for about six years. 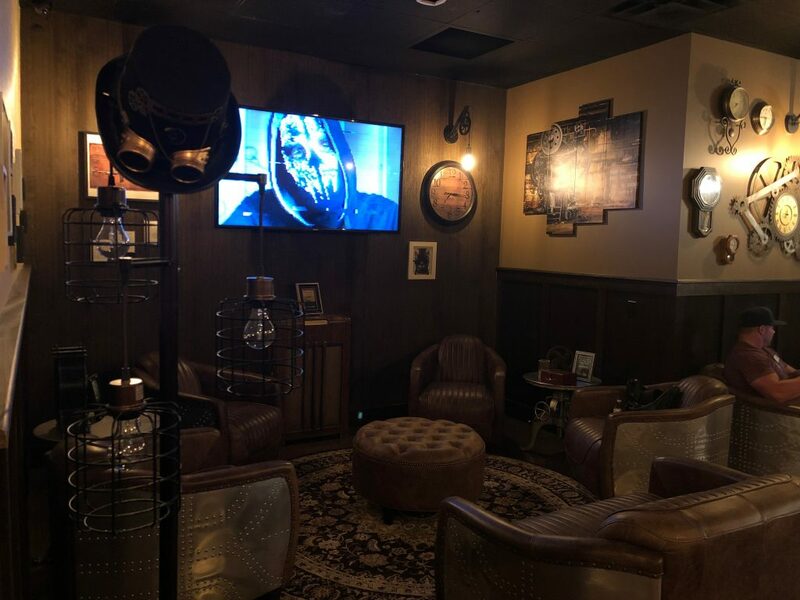 Last week they added a new form of entertainment to their already full slate in the form of Escapology, which hosts four new escape rooms. 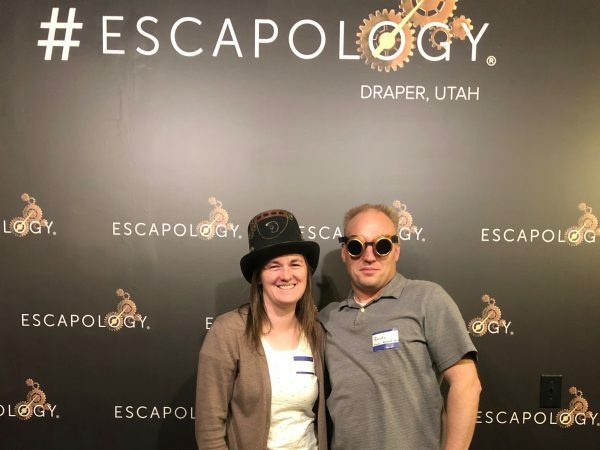 We had a chance to check out a new escape room as well as the bowling alley, arcade section, and virtual reality. It made for a really amazing night! 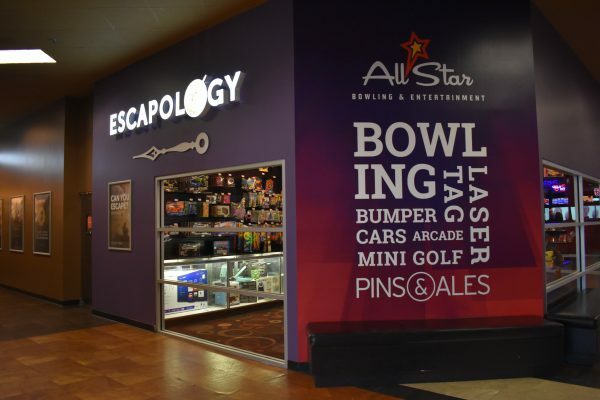 There are tons of things to do for everyone at All Star Bowling and Entertainment. We started with the bowling, and since we were on a date without the kids, they put us in the Pins & Ales room that has a bar. There are separate lanes for those who want to be in the bar, and though we chose not to drink, we did enjoy the less crowded atmosphere. 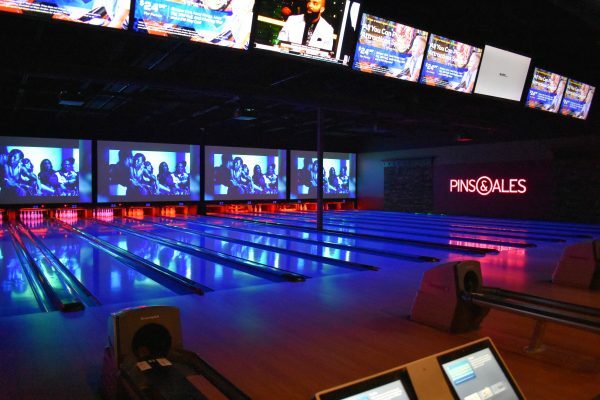 Both sets of lanes have music videos playing above the pins, and there are several bowling games to choose from. The atmosphere is a lot of fun in All Star Bowling! We loved bowling near the big screens! We have never had such great seats while we bowled! We started with a regular round of bowling, but afterward, we played a game of Angry Birds. In this game, a few of the pins were designated as “green pigs,” and scoring was determined by knocking them down. Sometimes you’d leave three pins standing, but still complete your objective. It was fun and a bit strategic to be scored in this way. With the music, it was the most fun bowling atmosphere we’ve ever experienced. 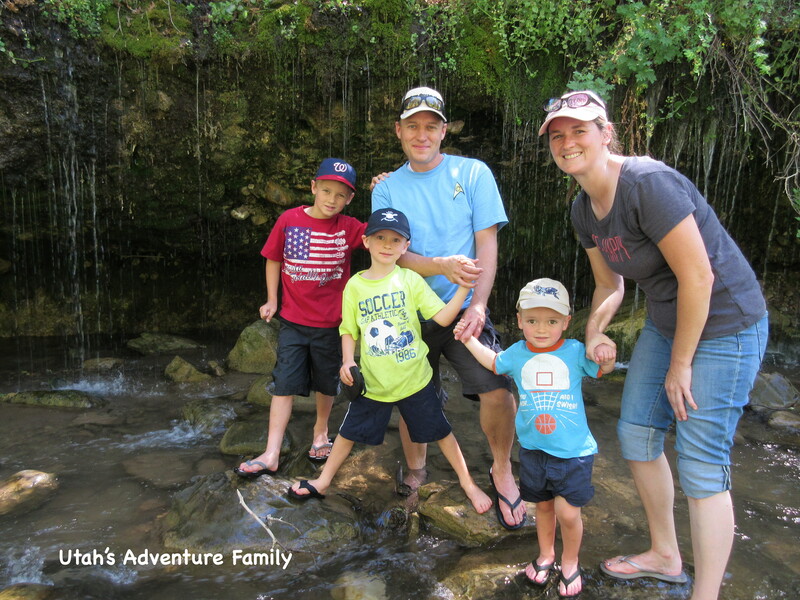 The variety of games is perfect for families. We also enjoyed eating as we bowled. 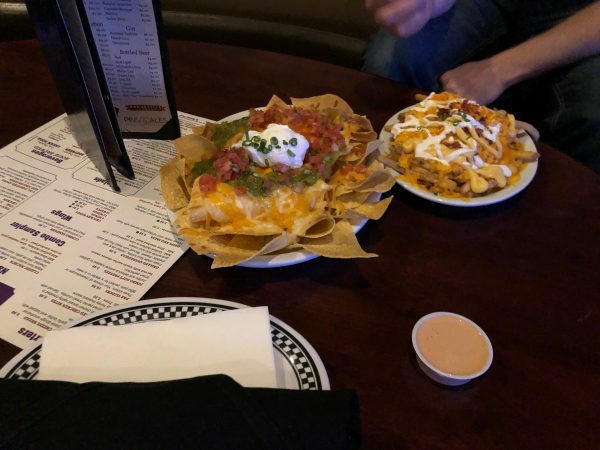 They brought some loaded nachoes and cheese fries right to our lane. 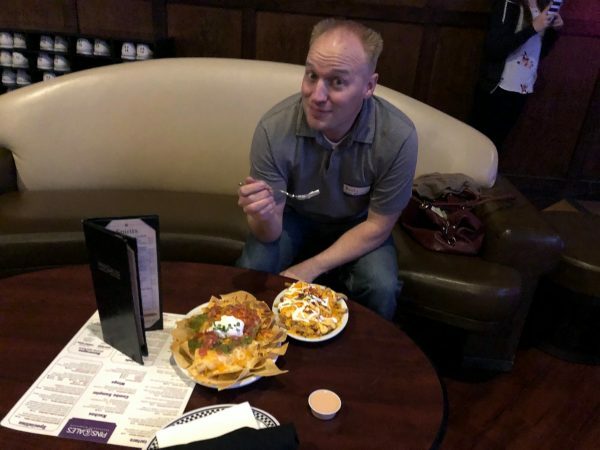 Best of all the couches were more like a nice sofa with a coffee table than the usual bowling alley tables. It was really clean and well cared for. There is also a small restaurant where you can order food and eat. 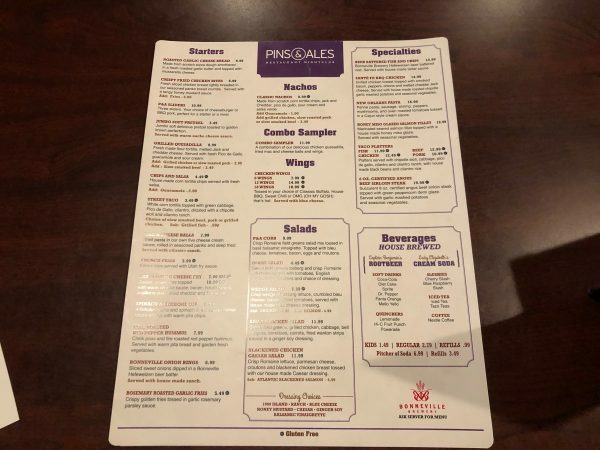 The menu is quite large with pizza, fries, and all sorts of family friendly food. We did try their homemade rootbeer and cream soda and it was amazing! The food was high quality, and we liked that there were so many options. This is the menu in Pins & Ales. 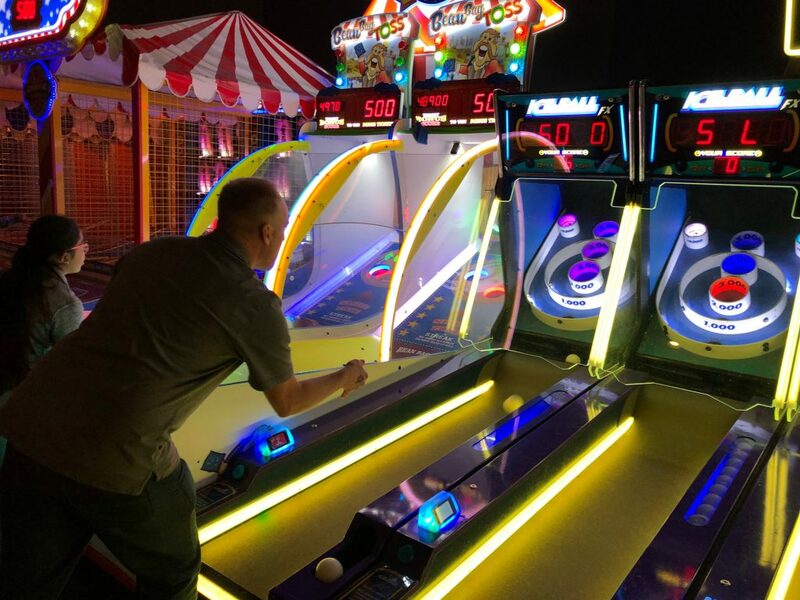 After bowling and cheese fries, we headed over to the arcade. In order to play the games, you get a card with money preloaded. Slide the card and earn tickets for how well you play. 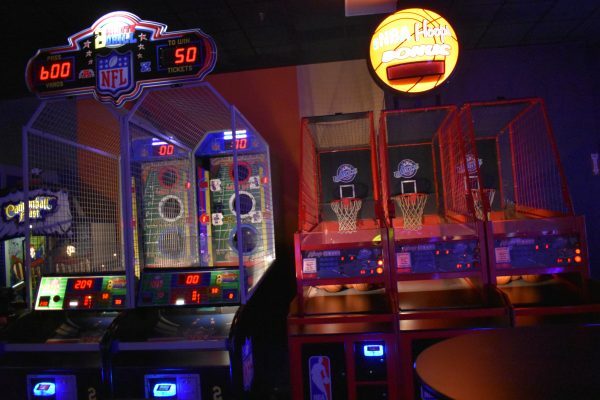 There are several types of air hockey, basketball and football tosses, skeeball, and other traditional games. A few of our favorites were the life-sized Space Invaders game and Deal or No Deal, which we spent most of our money on. As in other places, you earn tickets for scoring in these games. Tickets can be redeemed for prizes at a small shop. Our kids love earning and spending tickets. We always spend a lot of time at the sports games! There are a ton of different game to try! 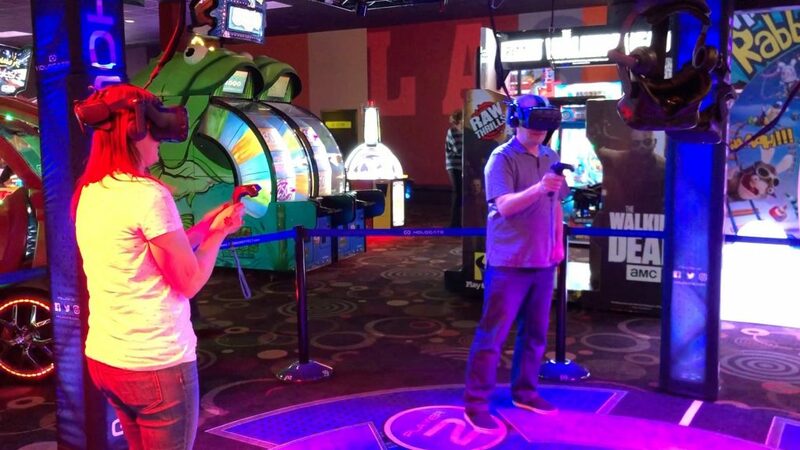 Of course, the highlight of the arcade is the virtual reality. 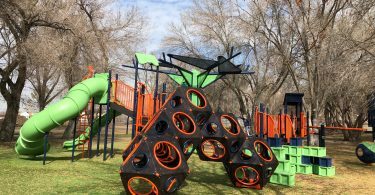 They have a variety of games, including kid-friendly snowball fights, zombie attacks, and a futuristic type game that is a dance where you punch approaching objects in time to the beat. This one was definitely the favorite, so make sure to give it a try. The Virtual Reality game was super fun! All Star Bowling and Entertainment also has some pretty cool bumper cars. There is a small area to drive, but it is larger enough that eight or ten cars can bump comfortably. This is one of our boys’ favorite activities. Next to the bumper cars is a mini-golf course. We didn’t have a chance to check it out, but those with us said it was really fun. They also have laser tag, which we didn’t have time for either. 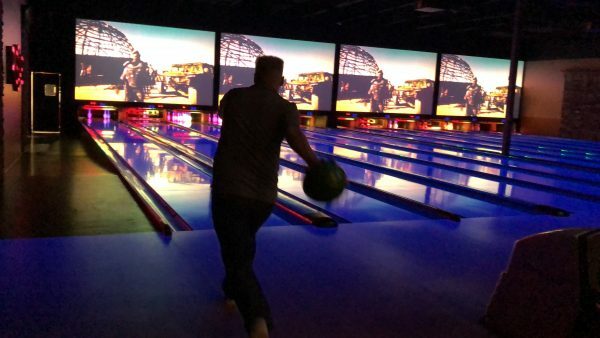 Honestly, there is so much to do at All Star Bowling, that it is impossible to fit it all into one night! 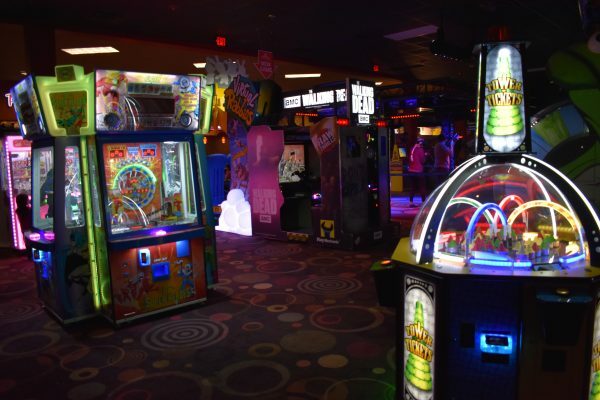 Each of these is a separate cost per person from the arcade or bowling. 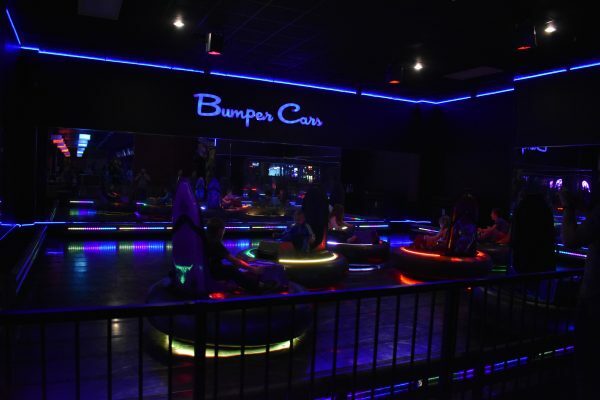 The lighting makes the bumper cars extra fun! 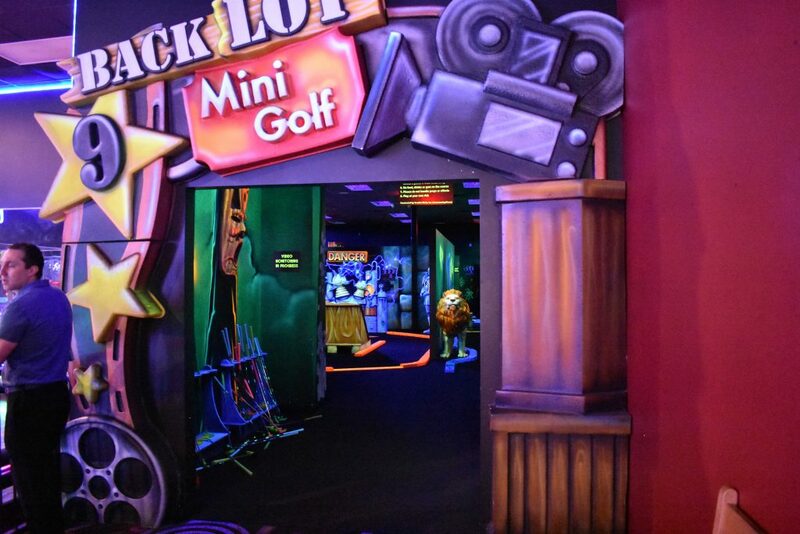 Mini Golf in the black lights is in the back corner. 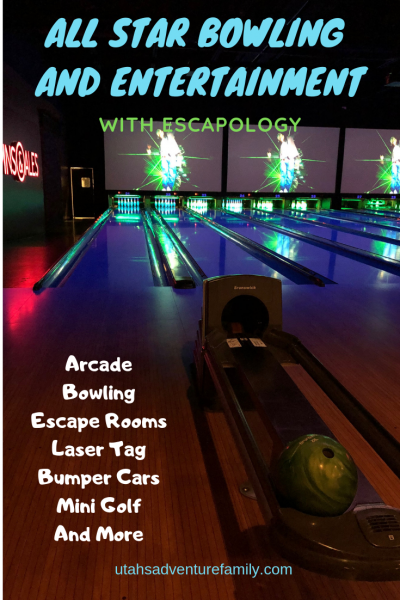 The new reason to go to All Star Bowling and Entertainment is their Escapology Room. They have four different rooms to escape from, and we really enjoyed ours. The premise of the room was that the bad guy has hacked into 100 million bank accounts. You are in his apartment trying to find clues to shut the hack down. You have 60 minutes to shut the hack down before the FBI arrives and pins the crime on you. We’ve done several escape rooms, and the puzzles in this one were as good as any. We won’t give away too much, but be prepared to enter multiple rooms before receiving your escape code. Friends of ours did a separate room where they were accidentally poisoned and had to find the antidote before their hour was up. They enjoyed their room as much as we did. The waiting room is really fun. 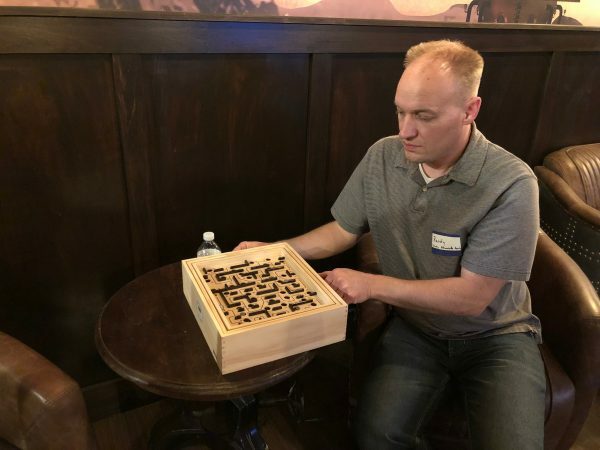 There are riddles and games all around while you wait. We had fun playing Labyrinth while we waited. Everyone gets their picture taken once they escape. Luckily, we escaped with 8 minutes to spare. All Star Bowling and Entertainment has too much to do in one night! Put this venue on your calendar for multiple nights. 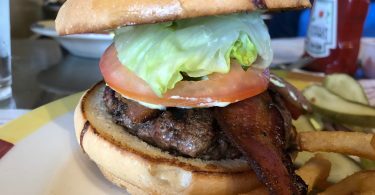 There is great food, so you won’t even have to leave for dinner! Decide before you go what you are planning to do. Each of the areas costs and is paid for in different ways. Bowling you pay for the lane by the hour. 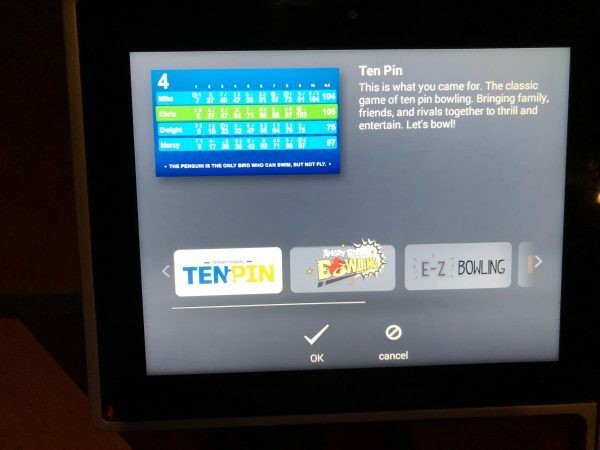 In the arcade, you load a card with an amount of money and swipe it at each of the games. And Escapology is paid per room that you try to escape from. All of the rates can be found here. Wear socks for bowling. You don’t want to buy socks there, so wear them or bring them if you’re a sandal person. Go on a weekday and early if possible. Prices are cheaper if you can go Sun-Thursday, or if you go on Friday before 5:00. All Star Bowling and Entertainment has 4 other locations: West Valley, West Jordan, Tooele, and Sandy. Schedule an Escapology Room before you go. Only a certain amount of people are allowed per room, and you don’t want to end up waiting a long time.